We know and love Josh Turner because of his previous hits such as Long Black Train that sounded so much like Johnny Cash, it was shocking. That was followed by Your Man, Would You Go With Me, Why Don’t We Just Dance, Firecracker and a few others. 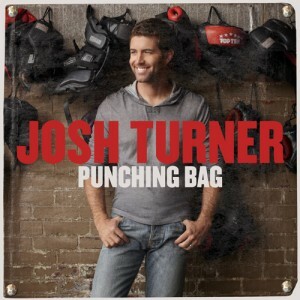 Now Josh Turner has a fifth studio album titled Punching Bag. With Michael Buffer introducing Turner as if he were a boxer in a professional boxing match the beginning to this CD is quite unique and after reading the CD booklet the title of the CD as well as referring to each track as a round becomes clear. Punching Bag is how Turner views life. He says it’s not about the hits that life brings but about how you fight back. Turner co-wrote 8 of these 12 tracks about traditional country themes of love, life, cheating, breaking up, hurting, starting over and faith. Turner is a deeply religious man and as with some of his previous songs,that element of faith is always present. This CD has a touch of everything that we look for and love in a country album including bluegrass, influences of Johnny Cash and George Jones and that traditional country sound without the rock, pop influence. There are three tracks that are absolutely outstanding. Cold Shoulder is a pure country ballad. The way he sings this love gone wrong song reminds us of George Strait and Alan Jackson but with Turner’s incredible baritone it sounds all the more unique. Whatcha Reckon has that traditional country sound to it and is a very upbeat happy love song. It is the kind of song that once you hear it, very pleasantly sticks in your mind for hours. The third song Pallbearer (with Marty Stuart and Iris DeMent) is a truly amazing song. It’s so incredible that words cannot do it enough justice.It is a sad song with a mournful sound but along with this mournful sound is not only a haunting, ethereal ambiance but also a traditional country slow ballad. It is so sad that at first the inclination is to not listen but then you hear the mournful melody, the haunting ethereal sound and listening all the way through is inevitable, you are drawn in and listen because you can’t help it. A song like this has not been around for quite a while. As Turner concludes his CD notes, he encourages all of us to keep going, no matter what is thrown our way. He hopes that his songs inspire and motivate us to keep going. Its’ easy to see how listening to his incredible voice and inspiring message will motivate us to do just that as we immerse ourselves in his music.